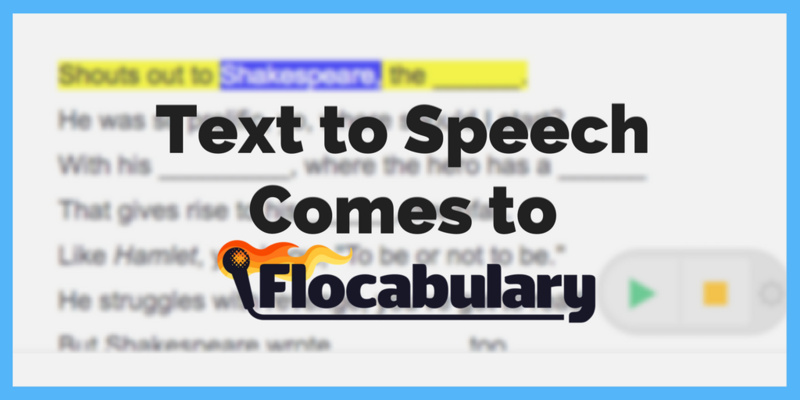 We've Added Text to Speech Functionality in Flocabulary! We’ve Added Text to Speech Functionality in Flocabulary! Big news! We’re proud to announce the release of our Text to Speech tool. You can now have highlighted text read aloud on any page on Flocabulary. Text to speech is a scaffold that supports reading and listening comprehension as well as writing and language skills. When Text to Speech is enabled in Flocabulary, students and teachers will be able to highlight any piece of text on the page (e.g. Read & Respond passages, lyrics, vocabulary definitions) and have it read aloud to them with the click of a button. Using Flocabulary’s Text to Speech Tool, students can see and hear the connection between written and spoken English. Each word is highlighted as it is read, and students can make gains in pronunciation, spelling, fluency and more. By reading text aloud, highlighting language, and allowing students to manipulate text independently, text to speech appeals to several modalities. Text to speech levels the playing field for struggling learnings and language learners by granting access to complex texts. The Text to Speech tool is a scaffold that increases access to rich and complex texts. It is particularly helpful for students who struggle with grade-level content, students who are English Language Learners (ELLs) and students with disabilities, including dyslexia. Early readers can use Text to Speech to build content knowledge while avoiding frustration, while readers at all levels can benefit from the multimodal approach to language. By empowering the students to self-select text as they need support, Flocabulary’s Text to Speech tool also builds metacognitive awareness. The tool, when made available, does not simply automatically read every word aloud on a page. Instead, students have the agency over their own learning and can choose when and if they need to use the scaffold. Many students may find they need the scaffold less and less as they master more vocabulary and become more fluent readers. Need more deets? Visit our FAQ page for more details on how to enable and use this new Text to Speech tool! Questions? Comments? We want to hear it. Drop us a line at info@flocabulary.com, shoot us a tweet, or leave feedback directly in the app with our ginormous feedback button (you can’t miss it! ).